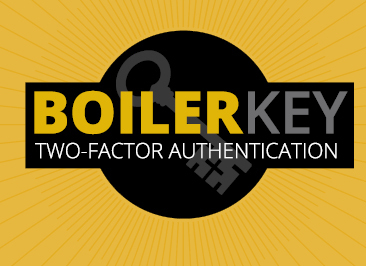 As of July 1, faculty, staff and student employees at all of Purdue’s campuses need BoilerKey to log into the Purdue employee portal and access leave requests, salary statements and other functions. BoilerKey also makes sensitive personal information more secure. If you have not yet signed up for BoilerKey, you can still sign up at purdue.edu/boilerkey. So far, almost 87 percent of those who have logged into the employee portal in the last six months and are eligible for BoilerKey have signed up. Purdue West Lafayette, Purdue Fort Wayne and Purdue Northwest employees can all sign up for BoilerKey by visiting purdue.edu/boilerkey. Users can choose from two options: the Duo Mobile software application or a hardware token if a smartphone or tablet is unavailable. BoilerKey adds a second login requirement to go with your password. At Purdue, it’s a numerical code randomly generated on a smartphone app called Duo or hardware token, in this case in the form of a key fob. Essentially, even if someone were to obtain your password (if you fall for a phishing email, for instance), your account would still be protected because only you can physically access your smartphone or key fob to get the necessary login code. BoilerKey protects your sensitive data, including financial information such as your bank account and PUID numbers. This information sits behind the OnePurdue SAP portal. Depending on your role with the university, you may use the portal for a variety of functions that are not limited to vacation requests, sick leave and other personal information. If you do not have BoilerKey, you can still sign up for it at purdue.edu/boilerkey. Until then, you will not be able to access the employee portal and do things such as submit leave requests until you have BoilerKey. Avoid having to sign up at start-of-school crunch time, sign up today. Encourage your colleagues to sign up, too.